joimax®, the global acting German developer and marketer of technologies and training methods for endoscopic minimally invasive spinal surgery, again exhibited at Chinese Orthopedic Association (COA), which took place Nov. 17th to 20th, 2016 at China National Convention Center in Beijing, China. During the exhibition, the new NASS – joimax® MISS Training Centre was inaugurated. The 18th Chinese Orthopedic Association Annual Meeting and the 11th International Congress of Chinese Orthopedic Association (COA) this year has again taken place in Beijing and was visited by more than 35,000 surgeons who gathered for the latest research results and up-to-date information on technology and clinical progression in orthopedics including spine surgery. joimax® had a major presence with a large booth showing its endoscopic minimally invasive product range. Furthermore on the two major meeting days, 30 lectures from well-known experts were given at its booth. During the COA, the new NASS-joimax® MISS Training Centre in China was inaugurated on Friday Nov. 18th, 2016. 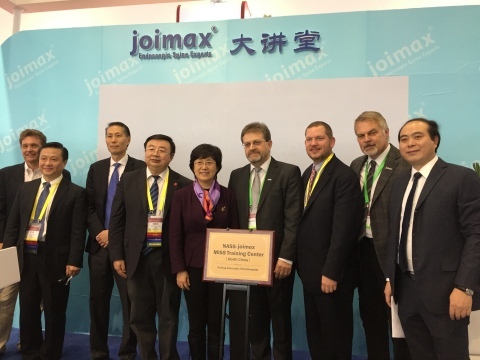 The ceremony took place at the joimax® booth together with leaders from the Peking University Third Hospital and members of the NASS Board of Directors. The Chinese market is a very important one for joimax® because Chinese surgeons are highly interested in adopting and deepening their knowledge in endoscopic minimally invasive techniques. joimax® is playing a major role in advanced training and is a driving power in the field of continuing education. “With the launch of TESSYS® ISeeUTM, which has been newly designed especially for the Chinese market, joimax® offers an even more simplified access under facilitated orientation,” says Wolfgang Ries, CEO and founder of joimax®. “The existing TESSYS® trays can furthermore be upgraded with the TESSYS® ISeeUTM supplements,” he continues. Moreover, joimax® also presented its latest product, the newly launched Intracs® Interaoperative Navigation Tracking & Control System for the first time in China. Founded in Karlsruhe, Germany, in 2001, joimax® is the leading developer and marketer of complete systems for endoscopic minimally invasive spinal surgery. With TESSYS® (transforaminal), iLESSYS® (interlaminar) and CESSYS® (cervical) for decompression procedures, MultiZYTE® RT (e.g. for rhizotomy) and with MultiZYTE® SI for SI-Joint therapy or with EndoLIF® and Percusys® for endoscopic minimally-invasive assisted stabilizations, proven endoscopic systems are provided that, together, cover a whole variety of indications. With the newly launched Intracs® system, navigation is now faster, safer and more accurate than ever before using an electromagnetic (EM) field.